which build on the liner walls and has a corrosive affect on the flue liner. Cleaning also prevents the dangerous back-puff and carbon monoxide poisoning. National Fire Protection Association recommends cleaning and inspecting yearly. 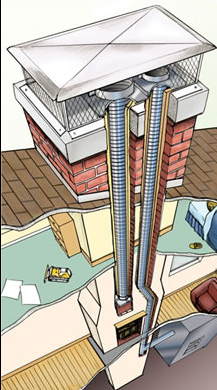 GAS FLUES – We recommend a yearly inspection and cleaning if necessary. Chimneys converted from oil to gas need cleaning and inspection yearly. These chimneys are in the flaking stage from the previous use of oil. and smoking problems. If your fireplace is used, it needs cleaning and inspection yearly. DRYER VENTS – Should be cleaned yearly to prevent dryer vent fires. and/or run. 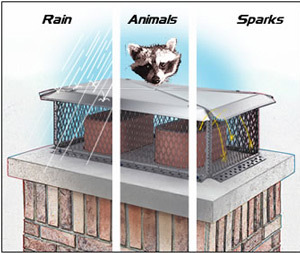 We also install new vent systems and inspect your present system.